CarGurus has 51,381 nationwide Fusion listings starting at $780. 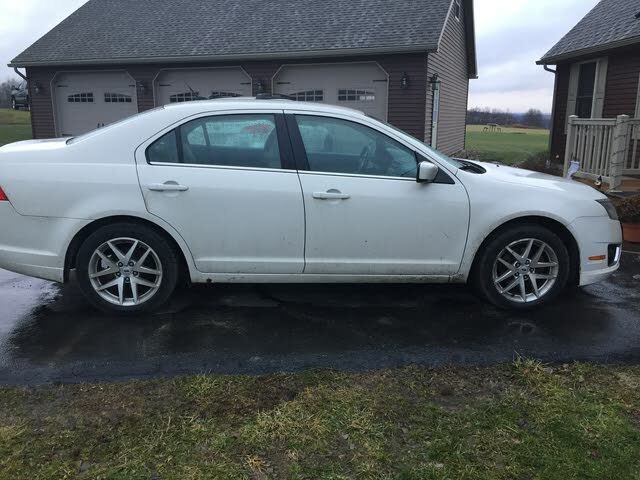 The 2011 Ford Fusion sedan counts sprightly performance and an appealing price among its many virtues, allowing it to compete head-on with the heavy hitters in the midsize sedan class. Ultimately the 2011 Fusion lacks the buttery refinement of the Toyota Camry or Honda Accord, and resale values are also likely to lag behind those of the class leaders. Ford is very close to the bullseye with the 2011 Fusion. While Honda and Toyota continue to set the pace in the family sedan market (with upstart Hyundai’s Sonata nipping at their heels), consumers looking to buy American are no longer faced with the prospect of a cheaply made penalty box on wheels. With a few more refinements (and either a wagon or hatchback version, please! ), the Fusion may one day enable Ford to reclaim a position of leadership in the marketplace. The Fusion remains basically unchanged for 2011; last year’s major freshening was deemed enough to keep the model current in an evolving marketplace. With attractive, edgy sheet metal and a slew of engine and trim choices (including a hybrid version), the 2011 Fusion indeed provides stiff competition for the Toyota Camry and Honda Accord. Ford has left the larger end of the market to its new Taurus sedan, thus the Fusion's dimensions are smack dab in the middle of the class. The 2011 Fusion features a modern unit-body chassis and a firmly tuned suspension - a wallowing land yacht it isn't. Engine options run the gamut from an economical four-banger to a slick and powerful 3.5-liter V6. While domestic automakers have a difficult task in changing the perception that American cars can't match the imports for quality, the 2011 Fusion shows that Ford is making serious inroads. The Fusion's panel fit, paint quality and exterior detailing are all first-rate, while the newly updated interior features high-quality materials and appealing design. Independent data bears out the conclusion that the Fusion is built to last; last year's highly respected J.D. Power initial quality survey rated Ford as the top domestic automaker, above even Honda and Toyota. The base engine for the 2011 Fusion is Ford’s stalwart Duratec four-cylinder. Enlarged to 2.5 liters last year, this inline engine (shared with Mazda) punches out 175 hp and 172 lb-ft of torque. With all-aluminum construction and 16 valves, the four-banger compares well on paper with similar offerings from Honda and Toyota. In practice, however, the glassy idle quality and rev-happy smoothness of the Japanese engines just isn’t present here; the Duratec feels a tad gritty at full whack. The base engine mates to either a manual or automatic transmission, both offering six speeds. While the stick shift is a welcome choice in an American vehicle, it, too, cannot match the syrupy smoothness of a Honda. The automatic, however, is excellent; shifts are crisp yet smooth, and fuel economy is stellar at 34 mpg highway. Two V6 motors are offered for the 2011 Fusion. The first, a 3.0-liter variant that makes 240 hp and 223 lb-ft of torque, greatly improves the Fusion’s midrange punch. At the top of the range, a 3.5-liter unit borrowed from the Taurus churns out 263 hp and 249 lb-ft of twist, nearly matching the Camry’s class-leading output and providing very brisk acceleration. Both sixes are much closer to the competition in smoothness, revving quietly and quickly on regular gas. Sadly, no manual transmission is available with either V6. Instead a SelectShift manu-matic version of the six-speed automatic is standard. Six-cylinder Fusions offer optional AWD (a new system of Ford’s own design) with an electronic center differential that sends power fore and aft as needed. The final powertrain choice for the 2011 Fusion is a hot-selling hybrid unit co-developed with Toyota. This eco-friendly system uses a modified variant of the 2.5-liter I4 engine (running on an Atkinson cycle that improves efficiency) that combines with an electric traction motor to deliver 41 mpg in the city and 36 mpg on the highway. Mated to an electronic CVT (continuously variable transmission), the hybrid drivetrain is every bit as sophisticated as those from the market leaders and features a very slick computerized display screen in the instrument cluster that makes extracting maximum mileage downright fun. Much of the 2011 Fusion’s appeal lies in its driving dynamics. Ford has managed to endow the Fusion with a sprightly, almost European demeanor. Though NVH (noise, vibration and harshness) levels are not quite up to the buttery standard set by the Camry, the Fusion’s playful nature and solid construction make it an attractive alternative. Most 2011 Fusions feature an electrically assisted rack-and-pinion steering assembly that possesses progressive, natural weighting, but very little feedback. The performance-oriented Fusion Sport trim gets a more traditional hydraulic steering rack that greatly improves road feel. The sophisticated suspension consists of a front double-wishbone and rear multi-link setup with disc brakes all around. Handling is firm rather than plush, and body roll is well controlled. Though it understeers predictably when pushed, the front-wheel-drive Fusion acquits itself quite well on twisty roads with plenty of grip. All-wheel drive (AWD) is optional on upper trim levels and provides an even more surefooted stance. Base Fusions get 16-inch alloy wheels as standard equipment, while V6 models receive attractive 17-inch units. With plenty of tire sidewall to absorb bumps, the 2011 Fusion rides comfortably over road imperfections small and large. The Fusion Sport trim gets larger 18-inch wheels along with a sport-tuned suspension that delivers a noticeably firmer, though not uncomfortable, ride. Interior design hasn’t been a strong point for American manufacturers of late, but Ford is doing its best to improve matters. Last year’s freshening spruced up the Fusion’s already attractive dashboard with higher quality soft-touch plastics and a new instrument cluster. The clean, symmetrical dash design and comfortable seats make the Fusion a pleasant place to whittle away the miles. Ergonomics are good, if not quite up to Toyota standards, and Ford’s slightly gimmicky "ambient lighting" actually does improve the mood inside. The Fusion features plenty of cabin space with dimensions that line up well with the Camry and Sonata, while falling slightly short of the limousine-like Accord. Trunk space is also generous; 16.5 cubic feet are on tap, and the rear seats can be folded down to accommodate outsize cargo. The optional SYNC music system and available navigation are nice touches, but the most impressive technological aspect is the Hybrid model’s interactive instrument panel. As we mentioned above the computerized display not only features crisp, legible readouts for speed and fuel, but also offers a leaf-shaped "green-meter" that shows the driver how efficiently they are driving. Achieving maximum mileage through gentle acceleration and careful planning is almost as fun as blasting through corners at full throttle. For 2011 the Fusion Hybrid also gets unique recycled fabric upholstery that is comfortable and eco-friendly. All 2011 Fusions share a comprehensive suite of safety and security features, including front, side and curtain airbags, seat-belt pretensioners and stability control. Fusion Hybrids also get a driver’s-side knee airbag that deploys from under the steering column to protect the driver’s legs in a crash. In government crash testing last year’s Fusion received five stars for the driver and passenger in frontal collisions. In side impacts the Fusion earned five stars for front-seat passengers and four stars for rear-seat passengers. Ford Fusion owners are effusive in their praise of the sedan's excellent quality and value. The fuel efficiency of the four-cylinder model is highly regarded, but it's the Fusion Hybrid that really wows owners with its incredible mileage. While some drivers wish the base engine offered more power, those who stepped up to one of the V6 motors are impressed with the Fusion's brisk acceleration. Handling was another strong point, with owners loving the point-and-squirt playfulness inherent in the 2011 Fusion's chassis. Quibbles were few, centering around some questionable ergonomics and a bit of intrusive road noise. What's your take on the 2011 Ford Fusion? Users ranked 2011 Ford Fusion against other cars which they drove/owned. Each ranking was based on 9 categories. Here is the summary of top rankings. 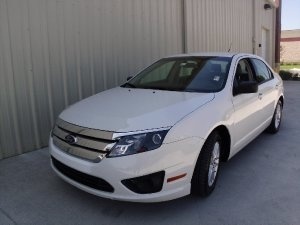 Have you driven a 2011 Ford Fusion? I changed a blown fuse. #29. Can you please tell me what do I do next? How Do I Change Status Of Sale? The person who initiated the sale is now saying they are waiting for a check, I want the car to still be listed "For Sale"